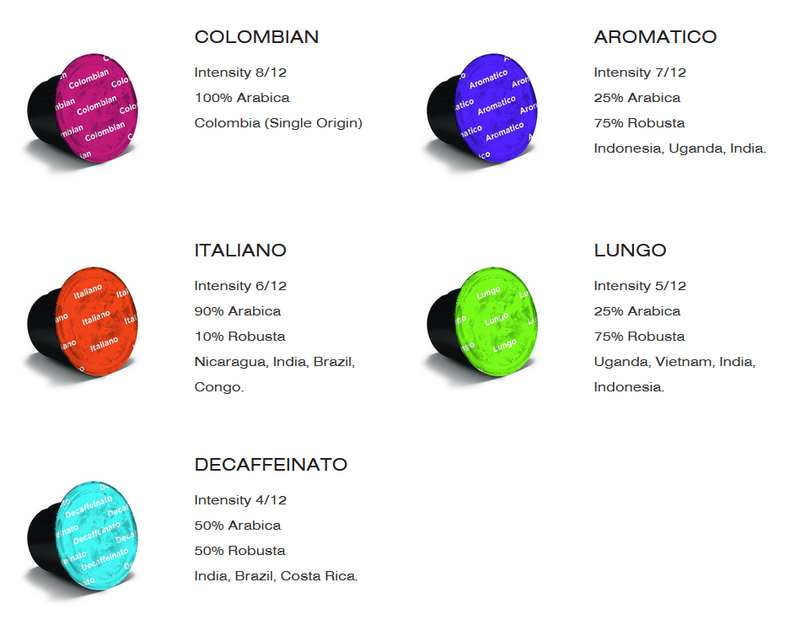 CAFFESSO Capsules - Royal Coffee Trading Ltd.
We are the exclusive importers and distributors of Caffesso coffee capsules in Cyprus. Caffesso coffee capsules works in all original branded Nespresso® machines. This means the full range of both Breville and De'Longhi machines including the Inissia, the U Machine, the Pixie, the Citi-z, the Maestria and all the Lattissima models. No problem. Caffesso coffee capsules is available in 11 different blends ranging from the robust Intenso to the mild Decaffeinato, including two lungo blends: Lungo (Intensity 5) and Lungo Forte (Intensity 8). 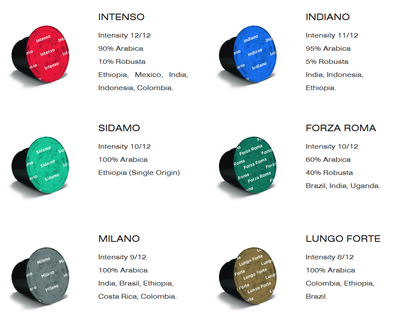 Each blend of Caffesso coffee capsules has a Nespresso® equivalent. The comparison is based on a number of key attributes ranging from the type of coffee beans and their growing conditions to the roasting process and the intensity of the flavour, the notes and aroma. We suggest ordering a variety of blends so you can find your personal favourites. We have great value Capsule Contracts for offices, including coffee making machines. In return, you will get your Caffesso coffee capsules delivered direct to your office. Please contact us for more information. Το νεότερο μας προϊόν είναι ένα μείγμα των καλύτερων αλεσμένων κόκκων καφέ με διαφορετικές ποικιλίες καψουλών οι οποίες συσκευάζονται σε ευπαρουσίαστα κουτιά των 10 τεμαχίων, οι οποίες είναι συμβατές με ΟΛΕΣ τις μηχανές Nespresso® σε πολύ ικανοποιητικές τιμές. Η εταιρεία που πραγματοποιεί την τοποθέτηση του καφέ σε κάψουλες έχει ως βάση της το Ηνωμένο Βασίλειο. Επίσης, να αναφέρουμε ότι έχουμε την αποκλειστικότητα τόσο στην Κύπρο όσο και στην Ελλάδα. 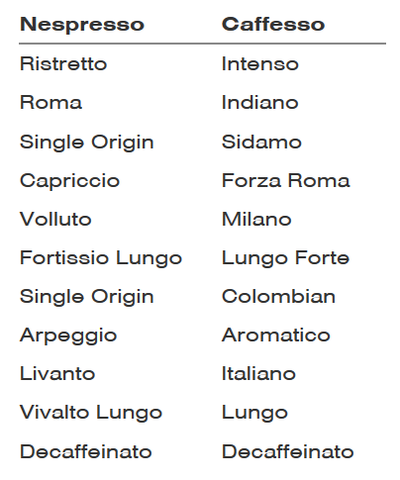 *Nespresso® is a registered trade mark owned by Société Des Produits Nestlé S.A.